Metal shavings litter the floor, and the smell of fire permeates the air. Sparks fly in corners of the workshop as the whirring of machinery rumbles in the ears of students. The room is filled with an industrial energy similar to a textile factory. This is the welding classroom on South Campus, a program designed to give students the basics of metal fabrication. Welding is a profession that builds our cities and homes. The basis of welding is fusing two materials, in this case metal, using heat and creating something else, South welding instructor Doug Barnett said. Welding is a versatile skill that can be applied to a variety of projects, he said. South student Blain Bridges got into welding after taking a course that introduced him to the craft in high school. “I was pretty good at it. Then when I got into college and I didn’t really know what to do and I was like, ‘Might as well try welding,’” Bridges said. South student Stewart Fetzik concentrates on the flux-cored arc welding process he is learning about in his Intro to Pipe class Nov. 12. 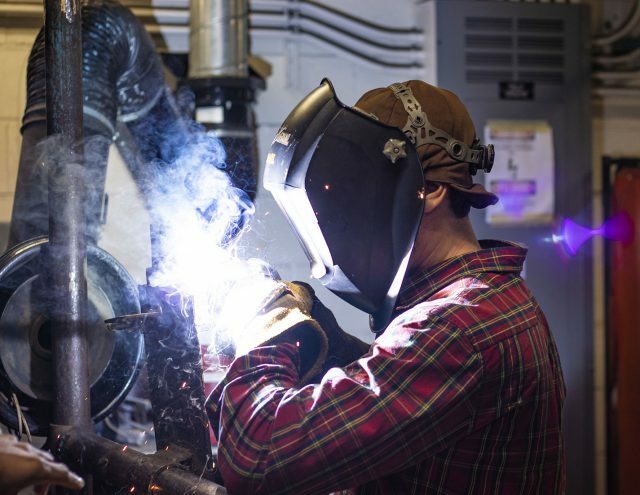 Intro to Pipe is one of 10 welding classes offered at South Campus. Now, he has his sights set on working in the pipeline industry. After this semester, he will go on to work with a steel welding company building factory parts. It’s not his dream job, but Bridges said he wants to save enough money to buy a rig truck, a requirement for those who want to work in the pipeline industry. “You have to have your own rig because you’re in the middle of nowhere, so there’s no shops so you have to have everything in the back of your pickup,” Bridges said. 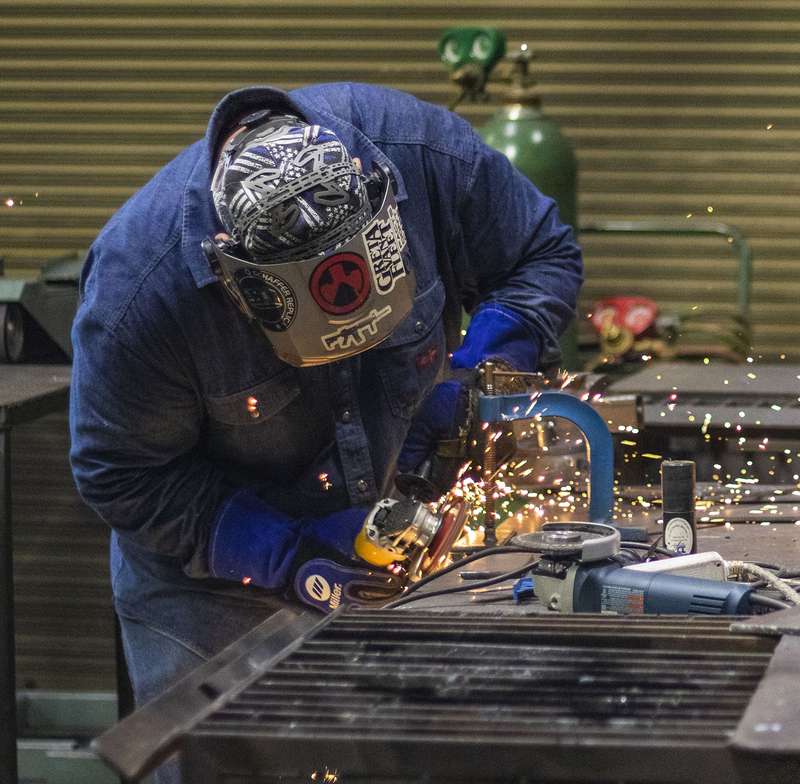 The future pipeline welder isn’t likely to suffer from burn out down the road as Bridges said welding helps clear his mind and he finds it therapeutic. The welding workplace is safe when students take precautions and follow the safety rules, but accidents do happen, he said. As such during a class in the first few weeks a student got injured while working with the equipment. “Cutting disks, which is something you cut metal with, can sometimes shatter and they’ll go everywhere, and she got it in her arm. She got thirteen stitches,” Bridges said. Serious accidents like those are rare and small burns or shocks are more common, he said. Gloves, long sleeve shirts, eye protection and closed-toe shoes are all required when working with any welding machinery, Bridges said. 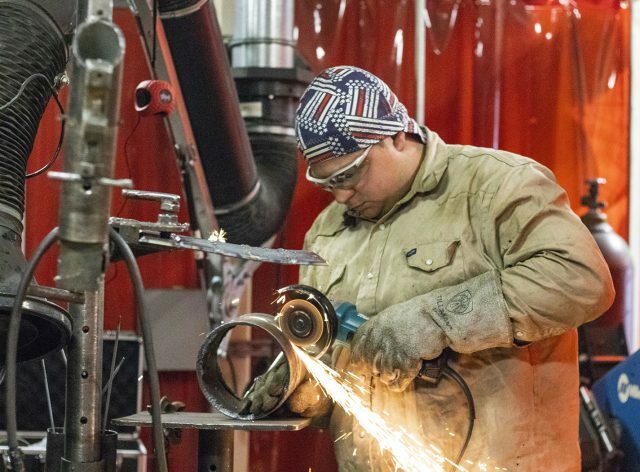 Welding isn’t a common career path for college students, but the demand for welders is growing bigger every year, said Barnett. This could be why TCC’s program never has a problem with low enrollment, and many of the welding courses have a waiting list, according to Barnett. “This trade’s design was built on the baby boomers, you know a lot of people are retiring and not replenishing the workforce,” he said. The classes fill up within a few days after registration opens because of the high demand for welding classes, he said. South student Devin Thompson uses an electric angle grinder while working on his final project for Intro to Pipe. South Campus’ degree and certification program for welding has 10 classes that fill up fast each semester, according to the instructors. He worked in the welding industry for six years before he transitioned to teaching at South Campus. He started teaching because he wanted to help those who wanted to enter the field. All of the welding instructors have worked in the welding industry, either as a supervisor or owning their own business. South student Joi Bouchard enjoys working with vehicles along with her husband who she runs a metal fabrication and diesel shop with. “There’s so many cool automobiles and motorcycles out there, and it’s so neat to see you can have the same truck and four different people will make it four different ways,” she said. Bouchard works more on the outsides of cars rather than the insides but applauds those who do. Her business, however, has a different focus. “We’re more like, ‘Hey, I got a cool truck, and I wanna make it cooler,’” she said. TCC’s welding program is very hands-on, which Bouchard said she appreciates because she gets to do the process herself unlike other classes that don’t have a physical end product. It is rewarding to see and touch the fruits of her labor from class, it makes her happy she has something to show what she’s learning. South Campus offers 10 different welding classes from entry level to advanced. Students can get a degree or certification in the field of study, but the certificate is only for entry-level jobs in production welding. The degree is for those who want to work as supervisors and want to leave understanding welding inspection, Barnett said. Regardless of whether his students pursue the degree or certification, Barnett wants all of his students to be able to get a job in the field and earn a living for themselves.